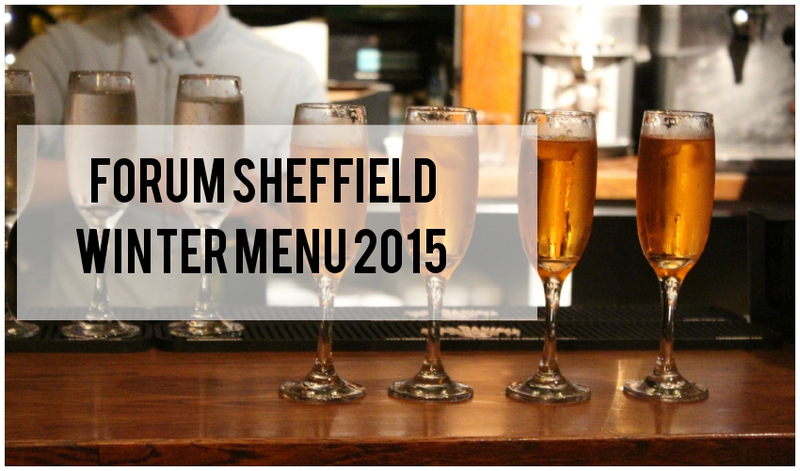 A few weeks back I was invited along to try out the new menu at Sheffield's The Forum Cafe Bar. For the last few years I've frequented The Forum mainly on Friday and Saturday nights for their cocktails and relaxed vibes. However, its never really been top of my list for eating out with friends, because I thought it was more just a pub grub style place. 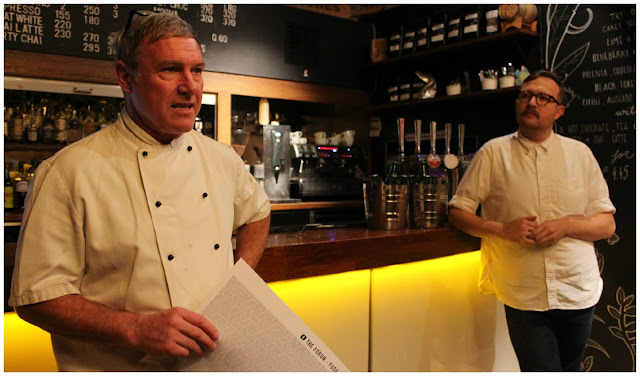 The email I received from Miles, the general manager, mentioned that we'd be treated to an evening of cocktails,food and also some filming for their new promotional video for their website. I was SO keen to go along and check out their new menu so, of course, I accepted the invite straight away. We arrived on the evening to find that they'd sectioned of part of the bar especially for us and they had a barman on hand to make us some rather special cocktails. 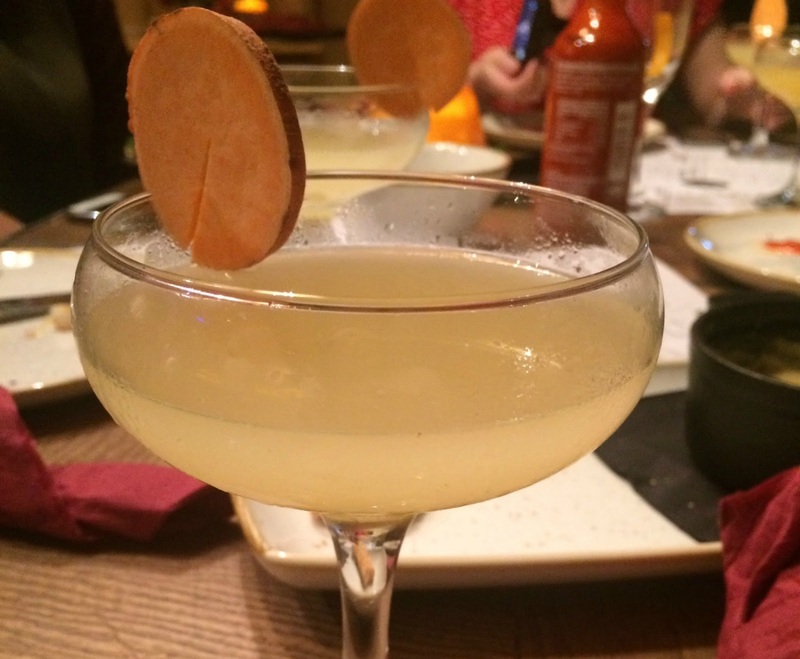 The first one, pictured above, was the Winter Spritz; consisting of Aperol, Prosecco and grapefruit bitters. 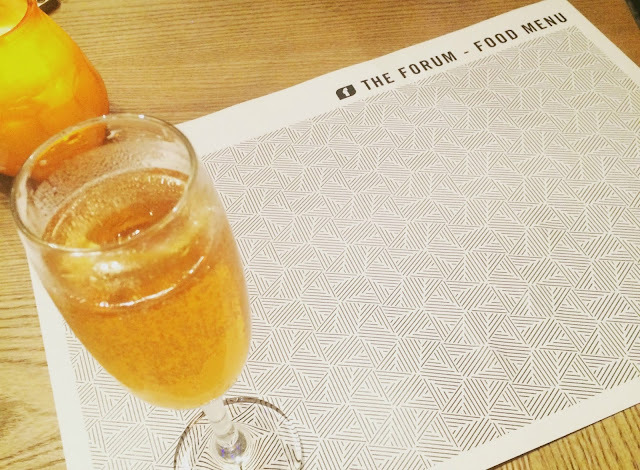 I first tried Aperol in Barcelona and loved it so it was nice to see that The Forum have incorporated this into their menu with a nice twist by adding, my fave drink, Prosecco. Once we'd all got settled and had a natter with the other bloggers the executive chef, Andy Burns (left) and general manager, Miles (right) explained that, over the past few years The Forum kitchen team took a few field trips outside of Sheffield and found when visiting restaurants and food fairs, one of the food fashions at the moment is Korean food. Food you can eat with your hands. The Forum then looked at their foody stats and found that about 80% of sales were burgers and sandwiches so they wanted to bring a Korean twist to the restaurant and widen the options, and flavours available to their customers. Of course this doesn't mean they've scrapped all their most popular dishes, they've just added new bits to inspire people to try new dishes from around the world. Yes, thats a piece of sweet potato you see on the glass!Its more for display and the colour of the cocktail really but worked so well with The Forum's new daiquiri style creation. I loved the sharpness of this lime infused cocktail and I will be ordering this next time I pop in for a drink or two. 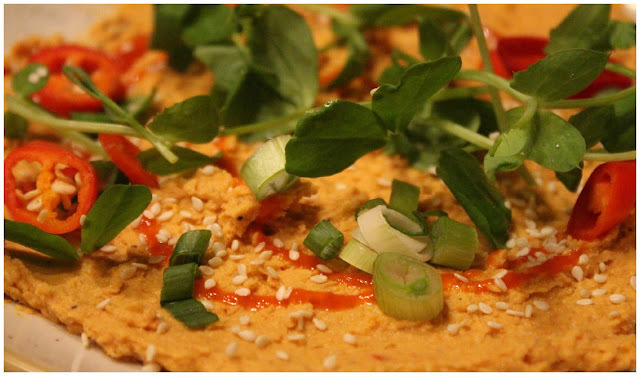 I was delighted to see that my favourite snack was served up as the first starter, Spicy Sriracha Hummus. The hummus was topped off with chilli,sesame seeds and spring onion. This dish is in their 'Small Plates' section of the menu and is £3.95 per portion or 3 dishes for £10. 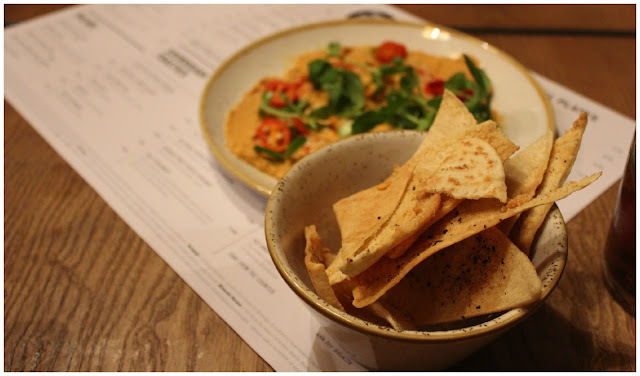 I liked the spicy kick to this hummus and the crunch of the pitta chips worked really well. I'd recommend trying this one out for sure! 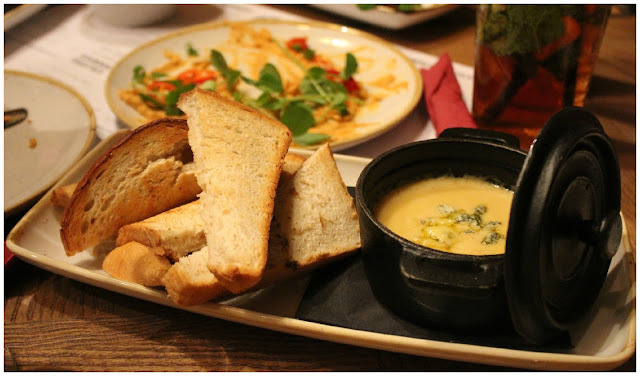 As a huge cheese lover this little pot of oozing cheese was a hit with me. The fondue was even topped off with a sprinkling of blue cheese..mmmmmm! The bread is a sourdough chunky loaf sourced locally from Seven Hills Bakery and went really well with the fondue. Surprisingly, some of the bloggers who weren't blue cheese lovers tried this and enjoyed it! The blue cheese wasn't too strong so won't be offensive to newbies! Again, this dish is £3.95 and included in the 3 for £10 offer. 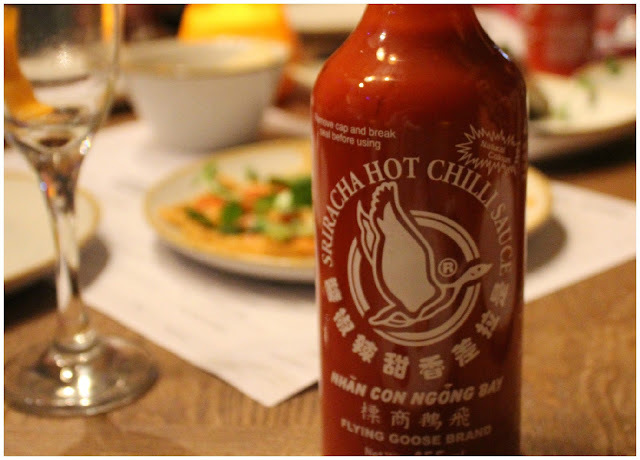 I love Sriracha hot sauce so was pleased when they came out with a selection of them for us to add to the dishes, they had a mild garlic and chilli one, medium, then an hot hot one for heat lovers. 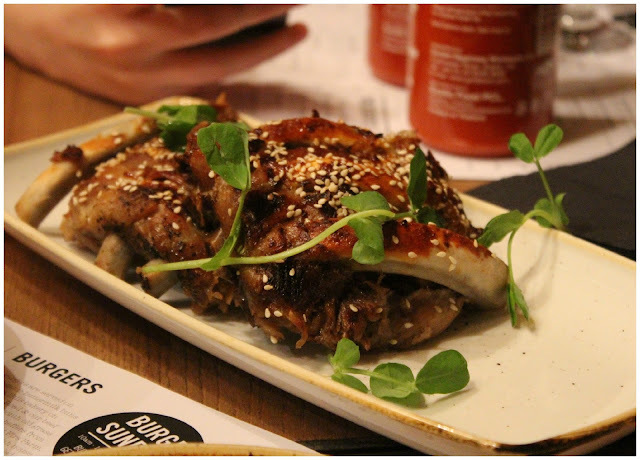 The final starter we sampled were the Baby Back Ribs (£3.95 or 3 for £10) with honey and sesame seeds. I'll admit it, since I got back from Barcelona mid September I've been trying to go as meat free as possible but being presented with these tasty looking treats meant I let myself off for the day.. it was SO worth it too. Crispy Cod Pakora (£8.50)- these were, by far, my favourite dish on the menu. The crispy parcels were served on a flatbread along with a little rice and some chilli's with Pak Choi. I added some hot sauce to mine for a bit more of a kick but they do come with a delicious Keralan curry mayo. Since the event, I've been craving these crispy cod bites SO much! 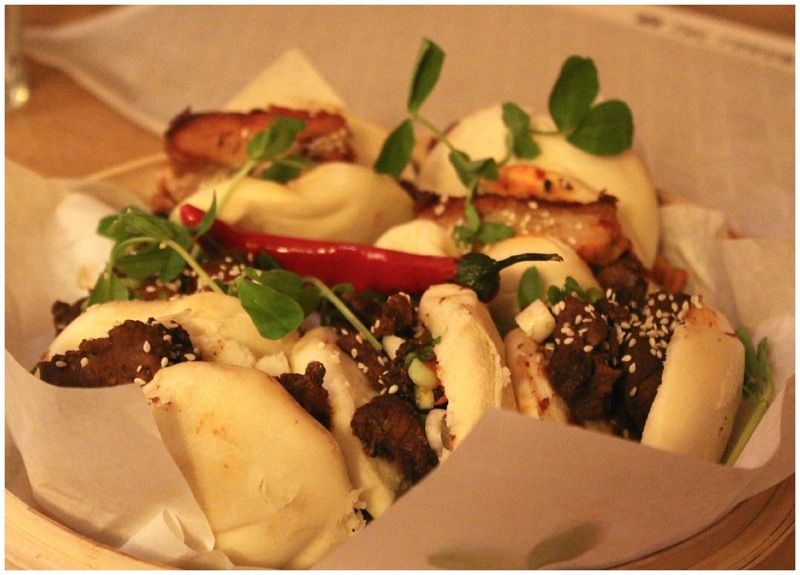 Next up was the Shaved Bulgogi Steamed Buns (£8.50)- I've never tried steamed buns so was looking forward to see what all the hype was about. The beef was so tender and flavourful, it worked really well with the steamed buns too.. slightly odd new texture but I can see these becoming quite addictive!Again, these were topped off with spring onion, wilted park choi and sesame seeds. Pork Tomahawk Chop (£9.95)- A large sweet soy and ginger chop served with roasted vine ripened tomatoes and fries. I wasn't a huge fan of this dish, mainly as I'm not eating a lot of meat at the moment but for you meat lovers out there this will be a huge hit- the meat was really well seasoned and had a slight stickiness to it which was rather yummy! 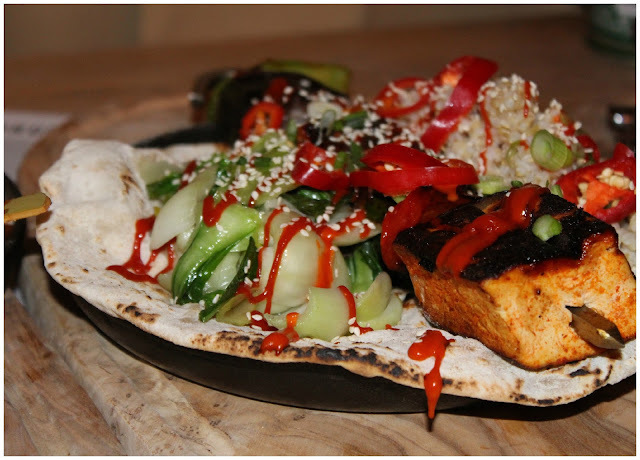 For the full time veggies out there The Forum have put together a Soy Glazed Tofu Skewer (£8.50), served with flatbread and rice. I'm not a fan of tofu unfortunately so this dish didn't hit the spot for me but I'm sure others will love it! You can also order a chicken version of this skewer.. yum indeed! 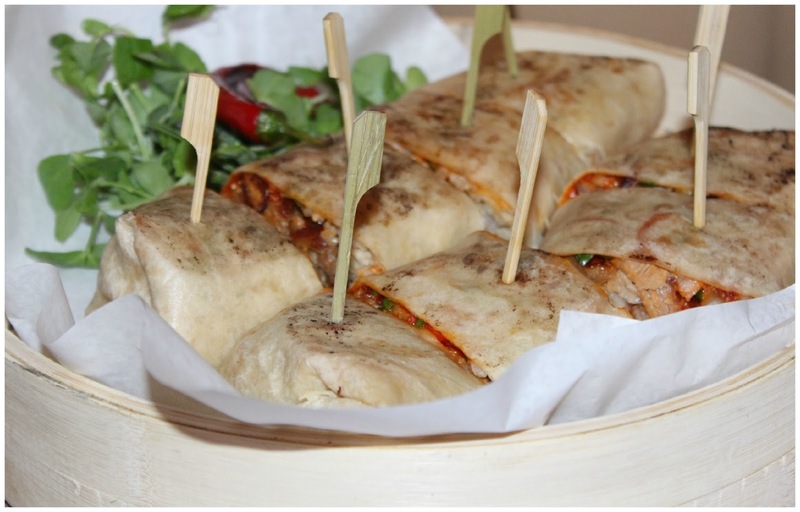 Korean Pork Belly Burritos (£8.50) with brown rice, gochujang mayo, chillies,spring onion and sesame seeds served in a flour tortilla accompanied with house fries. These were so good! Perfect amount of all of the burrito filling and so good dipped in the hot sauce. I'd recommend trying these out. Alongside the Korean inspired dishes we were also treated to some mini slider burgers, both falafel and beef- these were extremely yummy and something I'd recommend trying out if you haven't already. 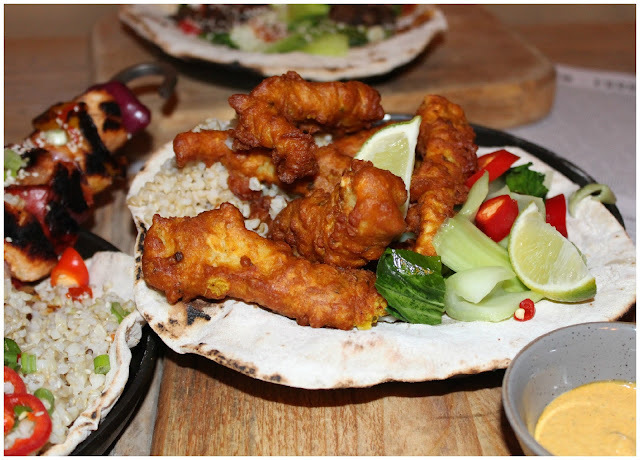 They come in the Small Plates menu too with chips for £3.95. Although we were all well and truly stuffed by this point it would have been a shame not to try out the new puddings from the menu! We were presented with Deep Fried Korean Ice-Cream Sandwiches (£4.50) and also a Rolo Brownie (£4.50). The Korean dish was tasty, interesting and something I'd never have thought to go for but the Rolo Brownie hit the spot for most of us. It was incredibly chocolatey and went very well with the vanilla ice-cream and raspberries. I was really pleasantly surprised by the Korean dishes and its nice to see that The Forum isn't just about burgers and chips. For me, there are a number of dishes I'd like to go back and try out again and I recommend you do the same! The quality of the food is amazing for the low prices that you pay and its always nice to give new flavours and dishes a try. You can find the menus online here and check out the pretty fancy video of the night here. Also, The Forum are on Twitter, so check them out here. 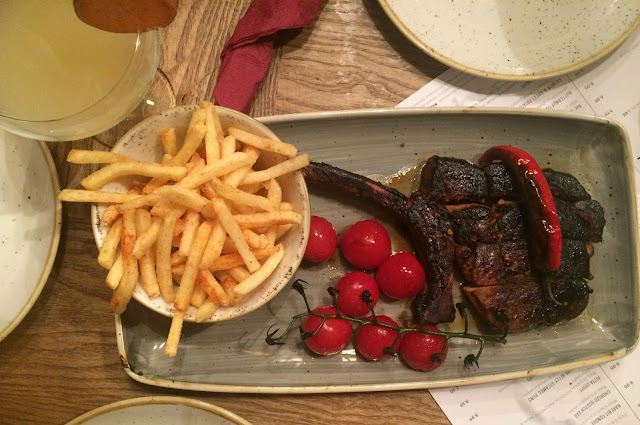 Have you tried any of the new items from the menu yet? Which dish from my photos would you like to try? I've never eaten there but I've spent a lot of time near by. Looks amazing!